Gaco Western’s GacoDeck Top Coat water-borne, single component elastomeric coatings are characterized by excellent hardness, strength, adhesion and water resistance. Please see Five/Fives for Promotion Special! GacoDeck allows homeowners to apply a high quality waterproof deck system over plywood, concrete, metal, fiberglass, and painted surfaces. The GacoDeck system provides lasting surface protection and waterproofing, plus a skid resistant surface that cleans up easily. One GacoDeck Kit will cover 100 square feet. Unlike other do-it-yourself deck systems, the GacoDeck system waterproofs rooftop decks over occupied living spaces. GacoDeck is the same top-quality, durable acrylic coating used by decking professionals. GacoDeck's unique acrylic polymer coating can be applied over plywood, concrete, metal, fiberglass, and painted surfaces (metal and fiberglass surfaces require a primer). Gaco Deck creates a fully adhered, durable waterproof membrane which expands and contracts along with your substrate. GacoDeck is perfect in hot or cold climates, because this high-quality acrylic coating does not soften in the heat or become brittle from cold. With GacoDeck Kit, You Get it All! With the GacoDeck Kit, there's no need to hunt for polyester tape, brushes or rollers. It's all neatly packaged inside. To make the application go smoothly, the GacoDeck Kit includes step-by-step instructions, and a DVD demonstration of a GacoDeck application from start to finish. After your project is completed, clean up is easy — GacoDeck cleans up with just soap and water. Complete step-by-step instructions for installing GacoDeck are found on this website and in the GacoDeck Kit. 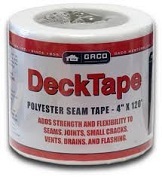 If properly applied and mantained, GacoDeck will waterproof and protect your deck for years. Clean your deck annually with GacoWash concentrated cleaner. GacoDeck coating will also provide an attractive, skid-resistant surface on platforms such as decks, boat docks, and stair treads, or on wheel chair ramps and walkways. For these applications, GacoDeck functions as a durable, easy to clean surface. See instructions for details. 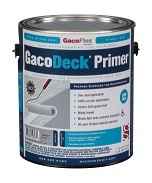 GacoDeck "The Easy Waterproofing" for Roof Decks. Many Deck coatings contain high levels of harmful solvents that are as dangerous to the environment as they are to the applicator and others in the immediate area. The outcome is increased difficulty and an unpleasant home improvement project that can make the most confident "Do it Yourselfer" think twice. The finished product is a rushed and messy job with a less than desirable final result. Many of these products require the experience and expertise of a professional decking company along with the associated high costs. Not so with GacoDeck! GacoDeck is a user friendly sophisticated Acrylic Polymer Blend originally developed for and still used by professionals since 1988. In simpler terms GacoDeck delivers all of the durability and toughness of a professionally installed waterproof deck coating without the harmful and unhealthy vapors and because GacoDeck is a water based acrylic, clean up is easy with just soap and water. The result is a durable, attractive and more rewarding home improvement project. The GACODECK KIT is designed to cover 100 square feet (9.3 m2). From DYI Guy of newark, Delaware on 5/5/2015 . My neighbors can't figure out how it's done and when I tell them it's a marine plywood deck with a polymeric coating I can almost hear the figurative self-kicking taking place. Not only do I have a good sized deck (6 years now)that makes it easy to shovel snow and power-wash I ALSO have an equal area of completely dry storage below for my crap. Try that with a tradition wood plank deck. Prepare, prepare, prepare...very dry glued and screwed plywood, flat-sanded seams, completely sealed and taped seams, and reinforced interface with deck posts is ESSENTIAL. Multiple coats (like 4 or 5) is also key. I've had cracks and a bubble or two (wet plywood, my bad) but I just cut the bad spots, fill, tape, prime, and repaint. I'm about to recoat the entire deck again because maintenance is just the way it is. HINT: Ask the experts at Gaco, do it correctly and you'll be the envy of the neighborhood deck parties. From Anonymous of Almeda, California on 1/24/2015 . I am not a professional. I bought the product as it was recommended to seal a flat roof area. I have used this product for about 5 years. I find a coating lasts less than one year. During this time there are cracks and water entry. Perhaps my expectations are too high, but I was hopping a coat would last longer. I do preventative maintenance once a year and find, with this product, it may not be often enough.